PURE+ Filter Start Gel is a live, concentrated bacteria culture for use in new pond filters. The gel based solution will stick to the filter media, allowing the nitrifying bacteria it contains to rapidly colonise your filter. Once the filter media has been coated with PURE+ Filter Start Gel, the beneficial bacteria within the gel will speed up the maturation of your filter media, while helping to convert ammonia and nitrite, resulting in less stressed fish. PURE+ Filter Start Gel now sits alongside the award winning PURE Pond Bomb and PURE Pond to make a full product range that should be added to every pond keepers’ armoury. 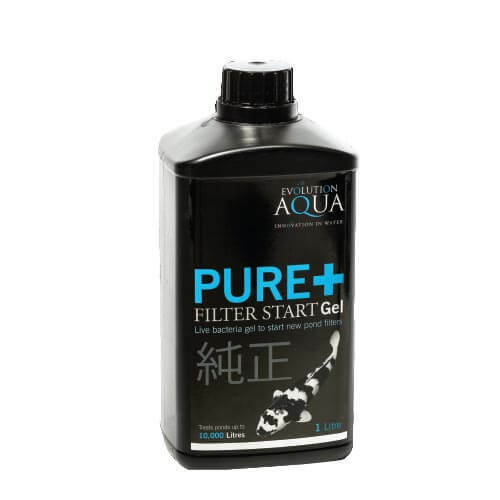 The PURE+ Filter Start Gel is well suited for use in bead filters, particularly Evolution Aqua’s K1 Micro Bead filters to speed up maturation from day one but is equally effective when spread on japanese matting, conventional beads and other types of filter media.